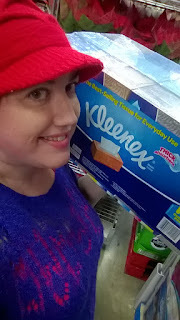 I headed down to Sam's Club, today, to check out the deals on Kleenex, which are bountiful and ready to be picked up by everyone this holiday season! The Kleenex Perfect Fit Winter Pack, with 3 perfect fit canisters and 8 lotion boxes, is especially fabulous because it fits in many spaces and with any decor in any room and makes those Kleenex moments even easier! You can dare to care by offering a hand to someone with allergies, or to wipe away tears of joy over the festive season, with gifts exchanging hands and loved ones coming to town with all those fabulous emotions! Right now you can get an instant $3 savings at Sam's Club until November 20th, which is more than a few extra tissues in your pocket and nothing to sneeze at and so caring AND sharing come at an even better price than ever before! 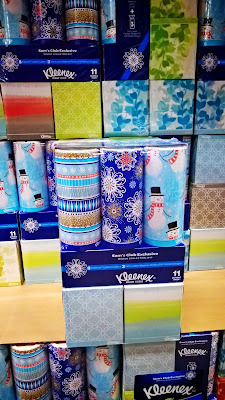 If you don't yet have a Sam's Club membership, then there are so many reasons you might want to get one - great prices, store pick ups and lots of fabulous deals throughout all the seasons, including these Kleenex goodies available (exclusively at Sam's Club) NOW! Don't forget that you can also find other Kleenex favourites at Sam's Club, including Anti-Viral AND Ultra-Soft in big packs to save those pennies, too! Show me how you care, with Kleenex! I'd love to hear from you! Great designs on these! They would add some holiday cheer to the home. :) I would be happy to get a pack. Those could be left in any room of your home they are so pretty! And take it from me--people with allergies need tissues in every room!! We just took advantage of this today! Was in Sam's Club and noticed the discount - perfect timing! I was just thinking last night that I need to stock up on some more Kleenex. I love the design of this one!